A.D. Oliver Middle School serves 837 students in grades 6-8. In 2013, Brockport Central School District established a professional services partnership with EL Education to strengthen student-engaged assessment practices across the district. In addition, leaders and teachers at Oliver Middle School decided to adopt EL Education’s Grades 6–8 ELA Curriculum. To support English Language Arts (ELA) teachers’ implementation of the new curriculum, leaders planned for sustained professional development through a train-the- trainer model. Prior to the school year, and again in January, an EL Education coach led teachers across the district in a daylong institute that familiarized them with the topics, texts, and tasks in the curriculum. They also modeled high-impact instructional strategies such as engaging students in complex text, asking strategic higher-order questions, and using learning targets. In addition, as part of a separate initiative (led by the Center for the Future of Teaching and Learning and funded by the Bill and Melinda Gates Foundation) Brockport Central School District and EL Education established math and ELA demonstration classrooms in schools across the district. At Oliver Middle School, leaders chose eighth-grade ELA teacher Holly Van Epps to regularly model lessons from the EL Education curriculum for her colleagues. Van Epps was an experienced teacher with deep knowledge of literacy standards and a commitment to coaching students to produce high-quality work. Van Epps and other school leaders worked with an EL Education coach for approximately half a day per month to ne tune and polish curriculum lessons before conducting demonstration lessons. When observing these lessons, ELA teachers used an observation protocol to capture notes and impressions. They then debriefed both with Van Epps and each other before returning to their own classrooms to try out what they’d learned. The combination of professional development and a dedicated demonstration classroom yielded powerful growth. Faculty across the district, and language arts teachers in particular, learned powerful new instructional techniques. The job-embedded coaching provided to Van Epps and leaders, combined with demonstration lessons, built teacher capacity across the school. From 2014-2015 to 2015-2016, there were clear patterns of gains in reading achievement across grade levels. Overall, the number of students achieving at NYS Levels 3 and 4 increased 12 percentage points from 34% to 46%. Students in grades 7 and 8 experienced the largest gains, moving from 36% to 49% (13 percentage point gain) and 33% to 51% (17 percentage point gain) respectively. Comparing Oliver Middle School results to statewide data gives further context for student proficiency gains. The number of students achieving at NYS Levels 3 and 4 grew at double the rate of New York State gains between 2014-2015 and 2015-2016. The EL Education curriculum is designed to address all three dimensions of achievement through standards-aligned lessons in which students read, think, talk, and write about compelling and complex text, engaging lessons that name and foster habits of character, and performance tasks that require students to plan, revise, and polish authentic writing. For example, in the module entitled “Finding Home: Refugees,” Holly Van Epps’ eighth-graders produced poetry with compelling connections to the universal refugee experience and deep emotional impact. Their poems, integrated with photographs, demonstrate skillful use of poetic devices, historical and cultural details, and narrative voice. The poems and supporting information about the project can be viewed at the Models Of Excellence website. I feel prepared to support the professional learning of other teachers. I feel energized about being a teacher. I feel confident in my ability to teach college and career ready standards. 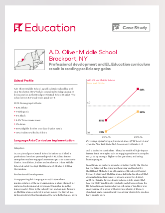 Download the PDF of the A.D Oliver Middle School case study here.